Pick your poison! Perfect for your Halloween event! 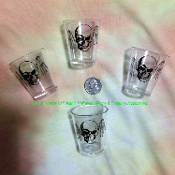 Shot glasses will skull head and bony fingers imprinted on them. Perfect for serving a shot of your favorite blood! Zombie Vampire Witch drink glass - Holds 2 ounces of your favorite liquor! Also makes a terrific everyday Toothpick or Cocktail pick holder!!! NEW in Forum Novelties manufacturer packaging. Each entrancingly printyed plastic acrylic shotglass is a spooktacular addition to a scary or renaissance theme costume party, setting an eerily death-defying mood. With its ghoulish Skeleton Skull dungeon-inspired design, it is the ultimate display for the most refined Halloween table. Crystal clear with black printed skull and hands creepy crypt decor on the front. No need to worry when your clumsy guests can't hold their liquor. Throwing a costume party and want everything to be perfect down to the cups your guests drink out of? If so, this Skeleton Skull shot glass set is just for you! Sure to be a hit with your guests and will go perfectly with your scary zombie, witch, vampire, medieval, alchemy, castle or other themed event. NOT dishwasher or microwave safe. Recommended HAND-WASH ONLY!!! Gothic Shooter with Scary Skeleton Skull surrounding your favorite toxic beverage! Includes four (4) plastic shot glasses. Shot glasses are made of a crystal clear durable molded plastic acrylic. Not intended for use in play by children under 14 years old.